Pink and sparkle gold It's My Half Birthday shirt, bodysuit. 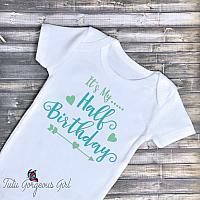 First Birthday shirt. Second Birthday shirt. Baby's half birthday bodysuit with pink and sparkle gold decal, or your choice of colors. Perfect for a calendar portrait session, baby shower, birthday gift, or just for fun. If you would like to change the colors please see the color chart in the link "Decal Colors Chart". Please only pick two colors. *Wording may also be changed to, It's My "First Birthday" or "Second Birthday". Please leave a message in your order notes if you would like this change.